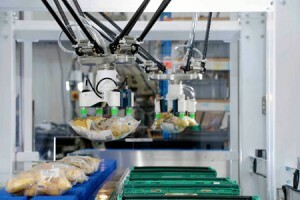 In food produce environments and packhouses, the benefits of automation when it comes to workforce health and safety are uncontended. 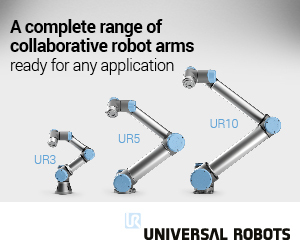 From eliminating arduous and repetitive tasks to working uninterrupted within inhospitable chilled settings, robots are most certainly the future. 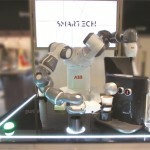 Case loading specialist Brillopak and industrial automation pioneer Omron explore how smart robots, hardware and software can be deployed to work collaboratively, safely and productively alongside human counterparts. 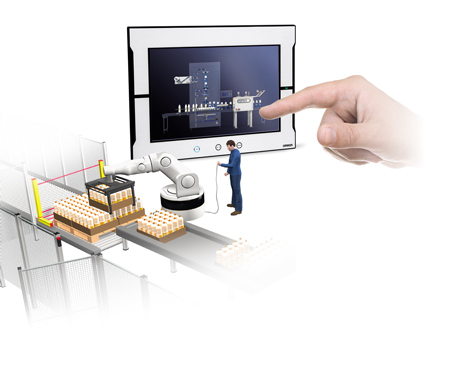 The picture frequently painted with Industry 4.0 is a “lights out factory” – a completely automated smart factory, requiring no human intervention. Yet, that’s not so much a journey forward as a complete step change, and for many it doesn’t represent a practical implementation of Industry 4.0 at all. 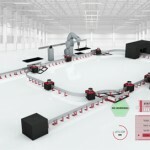 Operators and maintenance staff are going to be key elements of any Industry 4.0 smart factory installation well into the future, and that in turn means that safety continues to be a vital consideration. For packing operations commencing their Industry 4.0 journey, the issue is not so much one of removing people from the plant floor as implementing systems where people work in harmony and safely with the processes. The daily quest to optimise productivity and meet tight deadlines means that operators and maintenance personnel are almost forced to try to defeat safety systems. When the default reaction of a machine is an emergency stop triggered whenever an operator approaches, productivity can never be optimised. Indeed, such safety arrangements may almost be considered as confrontational from an operator’s point of view. Putting into context a typical packing scenario, David says many ‘stop-start’ activities can treble production downtime and eat into OEE. If the restart process from a controlled or emergency stop is not logical, simple and fast, this too encourages reckless behaviour among machine operatives, who typically bypass safety measures to get a machine up and running again. “Short line stops are often viewed as the bane of packing line operations,” notes David. To overcome situations like this, Brillopak’s P160 robotic case packer applies a combination of technology, variable speed drives and mechanics that make restarts less complex. As a result, personnel are less inclined to take short cuts. As plant floor space becomes more valuable and more machinery is squeezed in, fixed guarding is often considered a design restriction. Yet without it, the chances that operators and maintenance personnel might encroach into a danger zone increase. There are different ways to approach this dilemma suggests David. “Again, you are looking at the whole picture. This can include providing quick accessibility to clear a bottleneck or carry out maintenance, selecting the most efficient type of guard – ranging from locked, hinged or heavy weighted – and ensuring your workforce receives regular training. H&S execs we encounter are well informed and we always try to utilise their expertise at the start of each machine build to reach the optimal and safest solution. 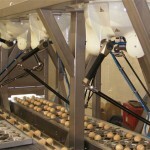 “Having to physically remove guards and reinsert them can be much more time consuming than locked panels,” says David. 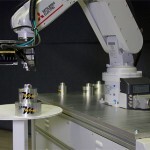 Ten minutes of machine downtime removing panels could potentially equate to 1,200 fewer units being packed, he asserts. Brillopak also factors ergonomics into machine layout, including how maintenance engineers can access key areas comfortably, avoiding overstretching and bending into or around tight corners. Another approach to physical or static guarding is to deploy force sensing technology. 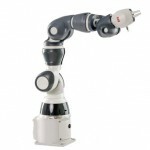 Here, the robot slows down when operators approach, only stopping when a set threshold is passed, which significantly improves productivity. The term ‘integrated safety’ has become a somewhat overused and misapplied phrase in recent years, with many considering it to be simply the ability for the safety network to exchange data with the standard control network. 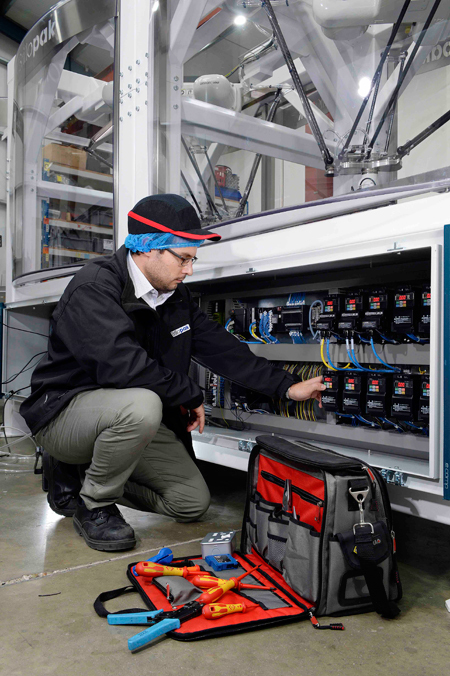 “Truly integrated safety fully embeds the safety aspect as part of the wider control system: safety controllers and safety I/O can be freely distributed around the standard I/O, with a single environment for configuration, programming and maintenance,” says Dan. Recognising the importance of safety within the truly collaborative machine, Omron has fully embedded safety within its Sysmac automation platform, making it easier for machine builders like Brillopak to consider safety functionality from the outset rather than as a costly and inflexible bolt-on at the end of the design process. A full suite of tested, proven and certified safety function blocks within the password protected Sysmac Studio development environment eliminate the cost and risk of a software free-for-all, and make it easy for designers to implement safety functions as required. The result – safety is no longer a ‘road block’ within the design process. 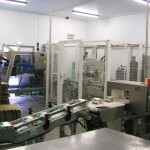 Brillopak also utilises variable speed drives to mange forces and provide enhanced control during a pick and pack process. 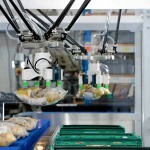 “Accurate placement of products into crates depends upon momentum and the control of movement by a robotic arm, which is critical to product presentation,” explains David. 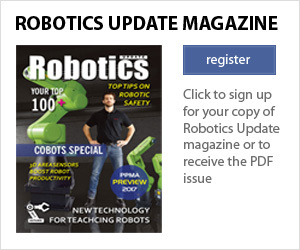 Food factory cobots are coming… or are they?